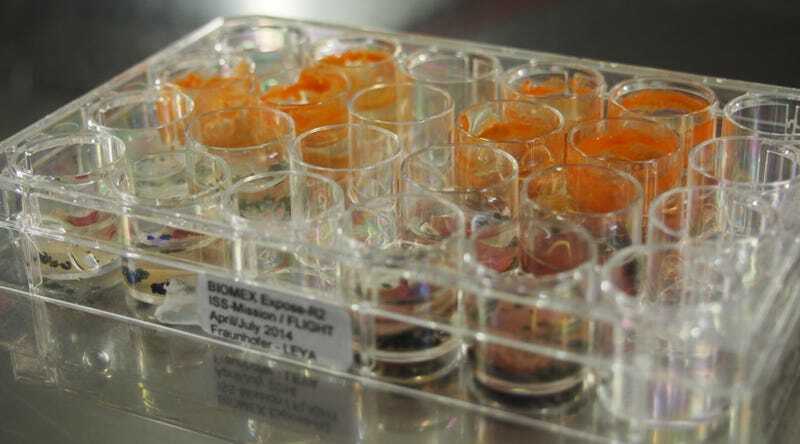 In an experiment conducted on the International Space Station, two different types of naturally-occurring algae were exposed to the extreme conditions of space. Incredibly, both strains survived. It’s a finding that could further our understanding of how life originated on Earth, and how colonists might be able to sustain themselves on Mars. The subjects of the experiment, which was organised by researchers from the Fraunhofer Institute for Cell Therapy and Immunology IZI in Potsdam, Germany, were a group of cryophilic, or “cold loving,” plants. After being subjected to wild temperature fluctuations, a near total vacuum, and blasts of cosmic radiation for 18 months, all but one of the samples grew into new populations back on Earth. The two strains of algae used, one from Norway and one from Antarctica, now join an exclusive list of organisms that are capable of surviving the extreme conditions of low Earth orbit—a list that includes some bacteria, fungi, and tardigrades. The finding offers a glimpse of what primitive plants might have looked like, and the kinds of crops that Martian colonists should be growing once we get to the Red Planet. Intriguingly, the discovery also hints at the possibility that life on Earth may have originated from somewhere else in the Galaxy—a theory known as Panspermia. Prior to this experiment, the researchers spent the better part of 18 years studying the survival strategies of cryophilic algae, cyanobacteria, mosses, fungi, and bacteria found in polar regions. It was already well established that these organisms can withstand extreme conditions in the lab, but the researchers weren’t able to replicate the exact conditions found in space. Hence the desire to send these hardy plants into space. The plants were slightly dehydrated in preparation for their space-based sojourn, and were transported to the ISS on July 23, 2014. During their 450 days outside of the space station, the plants were exposed to temperatures ranging from -4 degrees F (-20 degrees C) at night to 116 degrees F (47 degrees C) during the day. In addition to having no atmosphere to pull precious carbon dioxide and other gasses, the algae were subjected to blasts of ultraviolet radiation at levels that would kill practically any (other) creature on Earth. Sensors outside the ISS were used to log temperature changes and the amounts of incoming cosmic radiation. Once back on Earth, nearly all samples developed into new populations. Remarkably, only one specimen did not survive the ordeal. 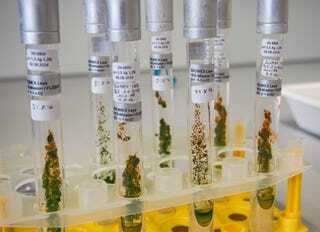 Looking ahead, the Fraunhofer scientists would like to gain a better understanding of the strategies used by the algae. In particular, they’d like to know the degree to which these plants were damaged by sun’s radiation, if at all. Such findings could influence efforts to protect human astronauts from similarly harsh conditions during a prolonged mission in space. To that end, the researchers are planning to conduct a DNA analysis of the plants, and use spectroscopic techniques to analyse biomolecules and other substances responsible for the shielding effects. Importantly, these findings could provide scientists with a glimpse of what primordial life was like when conditions on Earth were far more hostile than they are today. These plants, and their remarkable survival strategies, could also explain why some organisms are capable of surviving mass extinction events, such as an asteroid impact and ensuing climatic changes. Speaking of asteroids, these findings also lend credence to the Panspermia Hypothesis—the idea that meteors and comets could have potentially delivered simple organisms to Earth, thus kickstarting Darwinian evolution. The new research shows that certain plants can survive prolonged exposure to space. As to whether or not these seeds of life could withstand the extremes of atmospheric re-entry, that’s another story. Finally, the study has implications for would-be space travellers hoping to colonise Mars. Production of food on the Red Planet would be essential for long-term survival. Algae produces oxygen and proteins, making them a good source of food. Perhaps some of these hardy strains could be grown in special greenhouses or semi-transparent tents on Mars.